A neutrino detector is a physics apparatus which is designed to study neutrinos. Because neutrinos only weakly interact with other particles of matter, neutrino detectors must be very large to detect a significant number of neutrinos. Neutrino detectors are often built underground, to isolate the detector from cosmic rays and other background radiation. The field of neutrino astronomy is still very much in its infancy – the only confirmed extraterrestrial sources so far as of 2018 are the Sun and the supernova 1987A in the nearby Large Magellenic Cloud. Another likely source (3 standard deviations ) is the blazar TXS 0506+056 about 3.7 billion light years away. Neutrino observatories will "give astronomers fresh eyes with which to study the universe." Various detection methods have been used. Super Kamiokande is a large volume of water surrounded by phototubes that watch for the Cherenkov radiation emitted when an incoming neutrino creates an electron or muon in the water. The Sudbury Neutrino Observatory is similar, but uses heavy water as the detecting medium. Other detectors have consisted of large volumes of chlorine or gallium which are periodically checked for excesses of argon or germanium, respectively, which are created by neutrinos interacting with the original substance. MINOS uses a solid plastic scintillator watched by phototubes; Borexino uses a liquid pseudocumene scintillator also watched by phototubes; and the NOνA detector uses a liquid scintillator watched by avalanche photodiodes. The proposed acoustic detection of neutrinos via the thermoacoustic effect is the subject of dedicated studies done by the ANTARES, IceCube, and KM3NeT collaborations. Neutrinos are omnipresent in nature such that every second, tens of billions of them "pass through every square centimetre of our bodies without us ever noticing." Many were created during the big bang and others are generated by nuclear reactions inside stars, planets, and other interstellar processes. Some may also originate from events in the universe such as "colliding black holes, gamma ray bursts from exploding stars, and/or violent events at the cores of distant galaxies," according to speculation by scientists. In a neutral current interaction, the neutrino enters and then leaves the detector after having transferred some of its energy and momentum to a target particle. If the target particle is charged and sufficiently light (e.g. an electron), it may be accelerated to a relativistic speed and consequently emit Cherenkov radiation, which can be observed directly. All three neutrino flavors can participate regardless of the neutrino energy. However, no neutrino flavor information is left behind. In a charged current interaction, a high-energy neutrino transforms into its partner lepton (electron, muon, or tau). However, if the neutrino does not have sufficient energy to create its heavier partner's mass, the charged current interaction is unavailable to it. Neutrinos from the sun and from nuclear reactors have enough energy to create electrons. Most accelerator-based neutrino beams can also create muons, and a few can create taus. A detector which can distinguish among these leptons can reveal the flavor of the incident neutrino in a charged current interaction. Because the interaction involves the exchange of a charged boson, the target particle also changes character (e.g., neutron → proton). Antineutrinos were first detected near the Savannah River nuclear reactor by the Cowan–Reines neutrino experiment in 1956. Frederick Reines and Clyde Cowan used two targets containing a solution of cadmium chloride in water. Two scintillation detectors were placed next to the water targets. Antineutrinos with an energy above the threshold of 1.8 MeV caused charged current "inverse beta-decay" interactions with the protons in the water, producing positrons and neutrons. The resulting positron annihilations with electrons created pairs of coincident photons with an energy of about 0.5 MeV each, which could be detected by the two scintillation detectors above and below the target. The neutrons were captured by cadmium nuclei resulting in delayed gamma rays of about 8 MeV that were detected a few microseconds after the photons from a positron annihilation event. This experiment was designed by Cowan and Reines to give a unique signature for antineutrinos, to prove the existence of these particles. It was not the experimental goal to measure the total antineutrino flux. The detected antineutrinos thus all carried an energy greater 1.8 MeV, which is the threshold for the reaction channel used (1.8 MeV is the energy needed to create a positron and a neutron from a proton). Only about 3% of the antineutrinos from a nuclear reactor carry enough energy for the reaction to occur. A more recently built and much larger KamLAND detector used similar techniques to study oscillations of antineutrinos from 53 Japanese nuclear power plants. A smaller, but more radiopure Borexino detector was able to measure the most important components of the neutrino spectrum from the Sun, as well as antineutrinos from Earth and nuclear reactors. Chlorine detectors, based on the method suggested by Bruno Pontecorvo, consist of a tank filled with a chlorine containing fluid such as tetrachloroethylene. A neutrino converts a chlorine-37 atom into one of argon-37 via the charged current interaction. The threshold neutrino energy for this reaction is 0.814 MeV. The fluid is periodically purged with helium gas which would remove the argon. The helium is then cooled to separate out the argon, and the argon atoms are counted based on their electron capture radioactive decays. A chlorine detector in the former Homestake Mine near Lead, South Dakota, containing 520 short tons (470 metric tons) of fluid, was the first to detect the solar neutrinos, and made the first measurement of the deficit of electron neutrinos from the sun (see Solar neutrino problem). A similar detector design, with a much lower detection threshold of 0.233 MeV, uses a gallium → germanium transformation which is sensitive to lower-energy neutrinos. A neutrino is able to react with an atom of gallium-71, converting it into an atom of the unstable isotope germanium-71. The germanium was then chemically extracted and concentrated. Neutrinos were thus detected by measuring the radioactive decay of germanium. This latter method is nicknamed the "Alsace-Lorraine" technique because of the reaction sequence (gallium-germanium-gallium) involved. Gallium and germanium are named after France and Germany, respectively, and ownership of the Alsace-Lorraine territory has historically been a point of contention between France and Germany, thus the nickname of the technique. These radiochemical detection methods are useful only for counting neutrinos; no neutrino direction or energy information is available. The SAGE experiment in Russia used about 50 tons, and the GALLEX/GNO experiments in Italy about 30 tons, of gallium as reaction mass. This experiment is difficult to scale up due to the prohibitive cost of gallium. Larger experiments have therefore turned to a cheaper reaction mass. "Ring-imaging" Cherenkov detectors take advantage of a phenomenon called Cherenkov light. Cherenkov radiation is produced whenever charged particles such as electrons or muons are moving through a given detector medium somewhat faster than the speed of light in that medium. In a Cherenkov detector, a large volume of clear material such as water or ice is surrounded by light-sensitive photomultiplier tubes. A charged lepton produced with sufficient energy and moving through such a detector does travel somewhat faster than the speed of light in the detector medium (although somewhat slower than the speed of light in a vacuum). The charged lepton generates a visible "optical shockwave" of Cherenkov radiation. This radiation is detected by the photomultiplier tubes and shows up as a characteristic ring-like pattern of activity in the array of photomultiplier tubes. As neutrinos can interact with atomic nuclei to produce charged leptons which emit Cherenkov radiation, this pattern can be used to infer direction, energy, and (sometimes) flavor information about incident neutrinos. Two water-filled detectors of this type (Kamiokande and IMB) recorded a neutrino burst from supernova SN 1987A. Scientists detected 19 neutrinos from an explosion of a star inside the Large Magellanic Cloud—only 19 out of the octodecillion (1057) neutrinos emitted by the supernova. The Kamiokande detector was able to detect the burst of neutrinos associated with this supernova, and in 1988 it was used to directly confirm the production of solar neutrinos. The largest such detector is the water-filled Super-Kamiokande. This detector uses 50,000 tons of pure water surrounded by 11,000 photomultiplier tubes buried 1 km underground. The Sudbury Neutrino Observatory (SNO) uses 1,000 tonnes of ultrapure heavy water contained in a 12-metre-diameter vessel made of acrylic plastic surrounded by a cylinder of ultrapure ordinary water 22 metres in diameter and 34 metres high. In addition to the neutrino interactions visible in a regular water detector, a neutrino can break up the deuterium in heavy water. The resulting free neutron is subsequently captured, releasing a burst of gamma rays that can be detected. All three neutrino flavors participate equally in this dissociation reaction. The MiniBooNE detector employs pure mineral oil as its detection medium. Mineral oil is a natural scintillator, so charged particles without sufficient energy to produce Cherenkov light still produce scintillation light. Low-energy muons and protons, invisible in water, can be detected. An illustration of the Antares neutrino detector deployed under water. Located at a depth of about 2.5 km in the Mediterranean Sea, the ANTARES (Astronomy with a Neutrino Telescope and Abyss environmental RESearch) is fully operational since May 30, 2008. Consisting of an array of twelve separate 350-meter-long vertical detector strings 70 meters apart, each with 75 photomultiplier optical modules, this detector uses the surrounding sea water as the detector medium. The next generation deep sea neutrino telescope KM3NeT will have a total instrumented volume of about 5 km3. The detector will be distributed over three installation sites in the Mediterranean. Implementation of the first phase of the telescope was started in 2013. The Antarctic Muon And Neutrino Detector Array (AMANDA) operated from 1996 to 2004. This detector used photomultiplier tubes mounted in strings buried deep (1.5–2 km) inside Antarctic glacial ice near the South Pole. The ice itself is the detector medium. The direction of incident neutrinos is determined by recording the arrival time of individual photons using a three-dimensional array of detector modules each containing one photomultiplier tube. This method allows detection of neutrinos above 50 GeV with a spatial resolution of approximately 2 degrees. AMANDA was used to generate neutrino maps of the northern sky to search for extraterrestrial neutrino sources and to search for dark matter. AMANDA has been upgraded to the IceCube observatory, eventually increasing the volume of the detector array to one cubic kilometer. The Radio Ice Cherenkov Experiment uses antennas to detect Cherenkov radiation from high-energy neutrinos in Antarctica. The Antarctic Impulse Transient Antenna (ANITA) is a balloon-borne device flying over Antarctica and detecting Askaryan radiation produced by ultra-high-energy neutrinos interacting with the ice below. Tracking calorimeters such as the MINOS detectors use alternating planes of absorber material and detector material. The absorber planes provide detector mass while the detector planes provide the tracking information. Steel is a popular absorber choice, being relatively dense and inexpensive and having the advantage that it can be magnetised. The NOνA proposal suggests eliminating the absorber planes in favor of using a very large active detector volume. The active detector is often liquid or plastic scintillator, read out with photomultiplier tubes, although various kinds of ionisation chambers have also been used. At low energies, a neutrino can scatter from the entire nucleus of an atom, rather than the individual nucleons, in a process known as "Coherent Neutral Current Neutrino-Nucleus Elastic Scattering". This effect has been used to make an extremely small neutrino detector. Unlike most other detection methods, coherent scattering does not depend on the flavor of the neutrino. Most neutrino experiments must address the flux of cosmic rays that bombard the Earth's surface. The higher-energy (>50 MeV or so) neutrino experiments often cover or surround the primary detector with a "veto" detector which reveals when a cosmic ray passes into the primary detector, allowing the corresponding activity in the primary detector to be ignored ("vetoed"). For lower-energy experiments, the cosmic rays are not directly the problem. Instead, the spallation neutrons and radioisotopes produced by the cosmic rays may mimic the desired signals. For these experiments, the solution is to place the detector deep underground so that the earth above can reduce the cosmic ray rate to acceptable levels. Neutrino detectors can be aimed at astrophysics observations, many astrophysics events being believed to emit neutrinos. Gran Sasso National Laboratories (LNGS), Italy, site of Borexino, CUORE, and other experiments. ^ a b c KENNETH CHANG (April 26, 2005). "Tiny, Plentiful and Really Hard to Catch". The New York Times. Retrieved 2011-06-16. In 1987, astronomers counted 19 neutrinos from an explosion of a star in the nearby Large Magellanic Cloud, 19 out of the billion trillion trillion trillion trillion neutrinos that flew from the supernova. ^ IceCube Collaboration; Fermi-LAT; MAGIC; AGILE; ASAS-SN; HAWC; INTEGRAL; Swift/NuSTAR; VERITAS; VLA/17B-403 teams (2018). "Multimessenger observations of a flaring blazar coincident with high-energy neutrino IceCube-170922A". Science. 361 (6398): eaat1378. arXiv:1807.08816. Bibcode:2018Sci...361.1378I. doi:10.1126/science.aat1378. PMID 30002226. ^ a b Ian Sample (23 January 2011). "The hunt for neutrinos in the Antarctic". The Guardian. Retrieved 2011-06-16. The $272m (£170m) IceCube instrument is not your typical telescope. Instead of collecting light from the stars, planets or other celestial objects, IceCube looks for ghostly particles called neutrinos that hurtle across space with high-energy cosmic rays. If all goes to plan, the observatory will reveal where these mysterious rays come from, and how they get to be so energetic. But that is just the start. Neutrino observatories such as IceCube will ultimately give astronomers fresh eyes with which to study the universe. ^ Pierre Le Hir (22 March 2011). "Tracking down the crafty neutrino". Guardian Weekly. Retrieved 2011-06-16. But they are nevertheless almost undetectable: in just one second several tens of billions of neutrinos pass through every square centimetre of our bodies without us ever noticing. ... No magnetic field diverts them from their course, shooting straight ahead at almost the speed of light. ... Almost nothing stops them. ... Neutrinos are remarkably tricky customers. There are three types or flavours: electron, muon, and tau neutrinos, named after three other particles to which they give rise when they collide with an atom. ^ "All About Neutrinos". icecube.wisc.edu. Retrieved 2018-04-19. ^ MALCOLM W. BROWNE (February 28, 1995). "Four Telescopes in Neutrino Hunt". The New York Times. Retrieved 2011-06-16. NEUTRINO astronomy was given a strong push in 1987 when a supernova in a galaxy only one-quarter of a million light-years away from Earth flared into view—the closest supernova in 400 years. ^ J.P. (Dec 1, 2010). "Hang on, that's not a neutrino". The Economist. Retrieved 2011-06-16. The largest, IceCube, sits deep underneath the South Pole in a cubic kilometre of perfectly clear, bubble-free ancient ice and is set to start working in earnest early next year. All rely on detecting the flickers of light emitted on the exceedingly rare occasions when a neutrino does interact with an atom of ice or water. ^ Winslow, Lindley (Oct. 18, 2012). Coherent Neutrino Scattering, UCLA. Retrieved 29 Sept. 2017. ^ Akimov, D.; Albert, J. B.; An, P.; Awe, C.; Barbeau, P. S.; Becker, B.; Belov, V.; Brown, A.; Bolozdynya, A.; Cabrera-Palmer, B.; Cervantes, M.; Collar, J. I.; Cooper, R. J.; Cooper, R. L.; Cuesta, C.; Dean, D. J.; Detwiler, J. A.; Eberhardt, A.; Efremenko, Y.; Elliott, S. R.; Erkela, E. M.; Fabris, L.; Febbraro, M.; Fields, N. E.; Fox, W.; Fu, Z.; Galindo-Uribarri, A.; Green, M. P.; Hai, M.; et al. (2017). "Observation of coherent elastic neutrino-nucleus scattering". Science. 357 (6356): 1123–1126. Bibcode:2017Sci...357.1123C. doi:10.1126/science.aao0990. PMID 28775215. 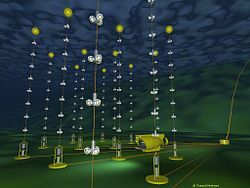 ^ "Neutrino detection goes small". Physics Today. 2017. doi:10.1063/PT.6.1.20170817b. ^ Levy, Dawn (Aug. 3 2017). "World’s smallest neutrino detector finds big physics fingerprint", Oak Ridge National Laboratory. Retrieved 29 Sept. 2017.